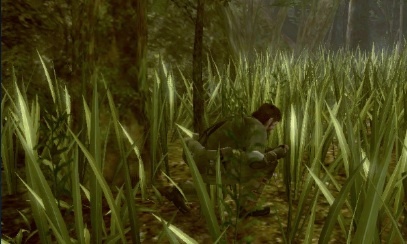 We know Metal Gear Solid: Snake Eater 3D is a port of an eight-year-old PlayStation 2 game, but that still didn't prepare us for how average it looks on Nintendo's 3DS. The good news? It's just a demo. Released yesterday, Konami's short and for the most part enjoyable slice of Naked Snake looks faded, pixelated and blurred. Granted, time doesn't necessarily react kindly to classic video games, but after all the talk about how the 3DS edition features visual enhancements, calling the graphics underwhelming is a nuclear mech powered understatement. That aside, this is also the first 3DS game that makes us want to invest in Circle Pad Pro. Resident Evil: Revelations was OK because we've used the same controls for a while, but Kojima Productions' default scheme that involves the face buttons to maneuver the camera up (X), down (B), left (Y) and right (A) is straight out of 1999. Easy enough to get used to, but far from ideal. So how's the rest of the experience? Exactly what we expected, with the inclusion of glasses free 3D (hurt our eyes after several minutes of use) and a touch screen inventory that is by all accounts phenomenal. Being able to switch weapons, cycle through camouflage, use items and view the map via touch works so much better than pausing the game and then using buttons to navigate. In addition, there's an option to go into first or third person aiming, also fully accessible through the touch screen. We prefer to see things from Snake's eyes, but either mode works just fine. Gameplay wise, it's Snake Eater. We experimented with different forms of face and body camouflage (leaf, tree bark, tiger) to better blend into the jungle, then snuck up behind armed guards, grabbing them around their necks and making the all important decision to interrogate, knock out or kill. Choose the latter, and Snake quickly punctures their throats with his combat knife, producing a little splash of blood. We also give Kojima and Co. props for letting us play with different toys, such as the fake death pill, cigar, sonar and binoculars. Good way to offer a taste of the classic MGS experience. As for the gyroscope, not impressed. 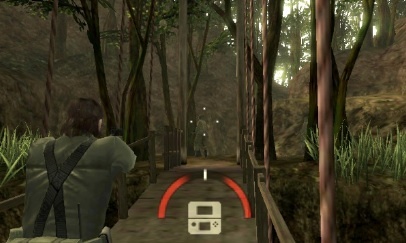 Snake just slides off the bridge, forcing us to continuously press Up on the d-pad. We hope it's easier in next week's boxed copy. Most importantly, those visuals need to improve. 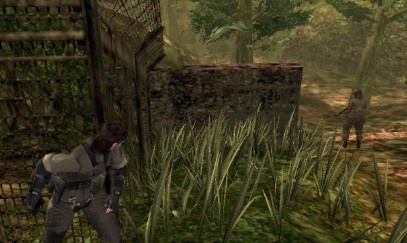 Publishers sometimes release demos that don't reflect final quality, so we'll cross our fingers this is the case with Snake Eater 3D. Otherwise, its existence will increase the graphical divide between 3DS and Vita.